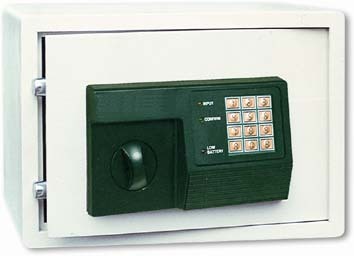 This Digital Security HOTEL SAFE features a large interior space. Our hotel safes is perfect for laptop computers, as well as passport, credit card, jewelry, and valuables. This hotel safes' quick access digital keypad (with master key backup) opens the case hardened security bolts. This hotel safe is made by heavy-duty all-steel construction with durable powder coated finish. The hotel safe is electronic digital control with override system and the panel of this hotel safes is used plastic film keyboard.